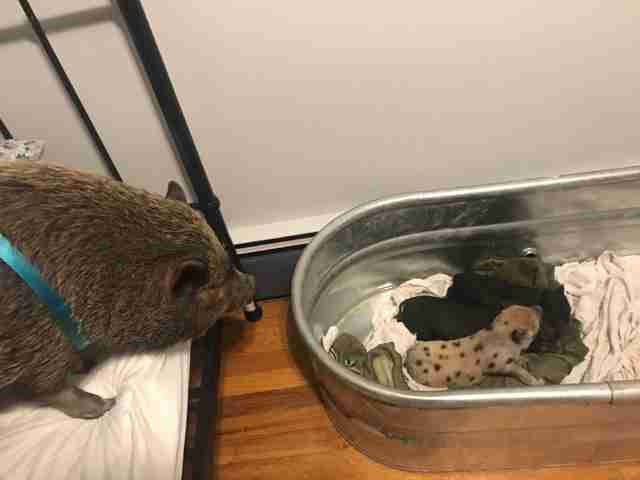 “She’d become extremely concerned when any of them squealed ... I feel like she had a deep understanding that they needed her comfort." Rachael Pitchford was on the lookout for another rescue pig to adopt. 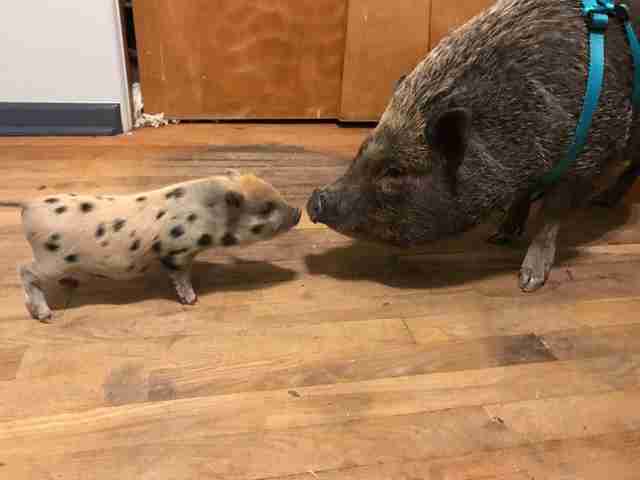 She already had Ruby, a 2-year-old potbellied pig whom Pitchford refers to as her “pig daughter,” but Pitchford felt that Ruby would be happier with a friend. 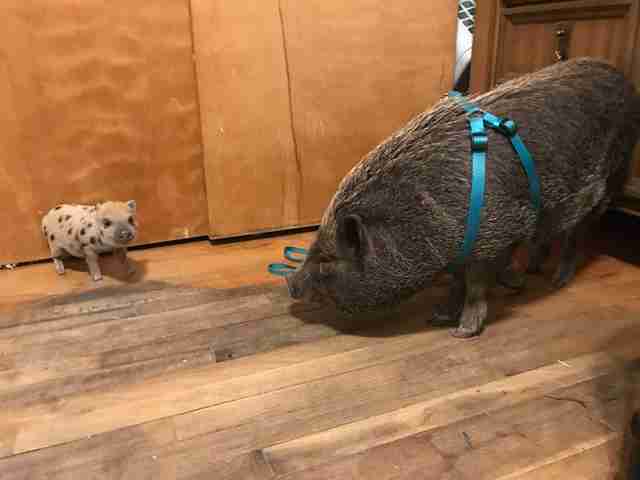 So a couple weeks ago, Pitchford wrote a post in a Facebook group for pig lovers, saying that she was interested in fostering or adopting a pig. She didn’t expect the response she got. “A woman wrote to me stating she had been ‘overrun’ by potbellies and all would be taken to auction … and was wondering if I’d like one,” Pitchford said. This raised alarm bells for Pitchford. 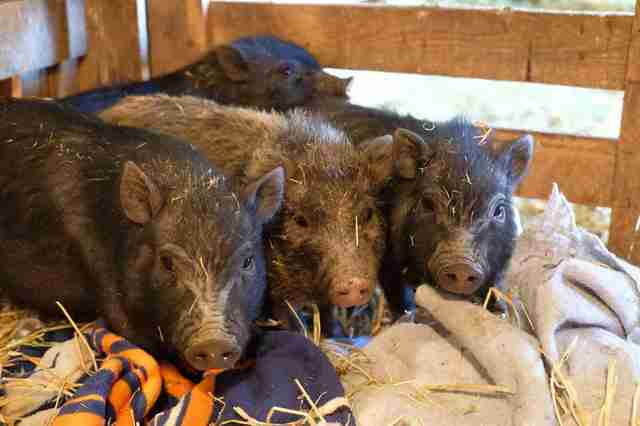 If the pigs went to auction, she worried someone would buy them under the false belief that they were teacup pigs. In reality, there’s no such thing — so-called teacup pigs sold by breeders are often juvenile potbellied pigs who are underfed and malnourished. But they’ll eventually grow up to be very big animals. Another fear Pitchford had was that someone would buy the pigs to eat them. Pitchford reached out to three rescue groups — Broken Shovels Farm, Hog Haven Farm and Rescued Friends Animal Sanctuary — and asked for their help. People from all three groups teamed up with Pitchford to rescue all of the animals. 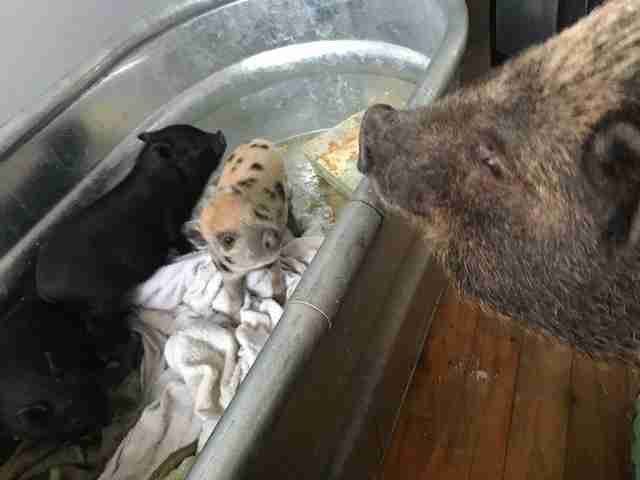 It turned out that there were 14 pigs who needed to be rescued, including three newborn piglets — Figs, Persimmon and Durian — who went to Broken Shovels Farm. 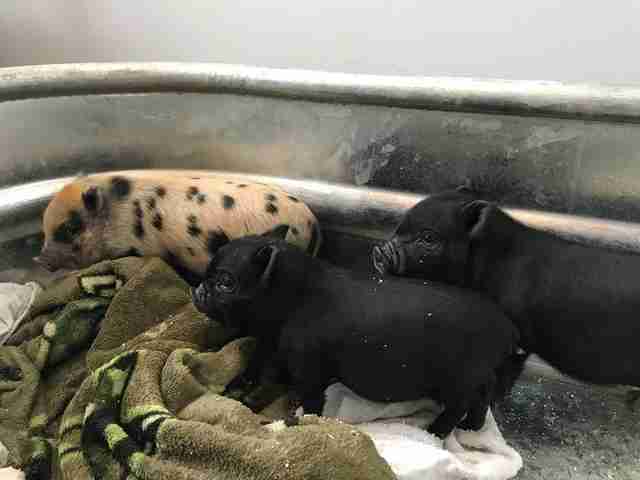 The piglets were too young to leave their mom, but the owner refused to surrender their mom to the rescue group. 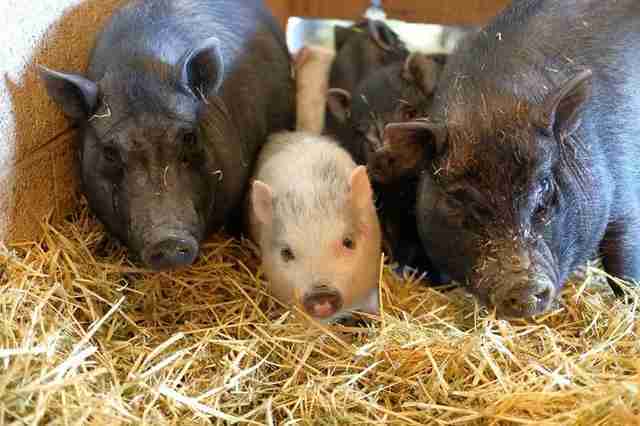 So Andrea Davis, founder of Broken Shovels Farm, had to bottle-feed the piglets to keep them alive. On Saturday, Pitchford and Ruby went to visit the newborns at Broken Shovels Farm, and Pitchford couldn’t believe how Ruby reacted. Then another amazing thing happened. 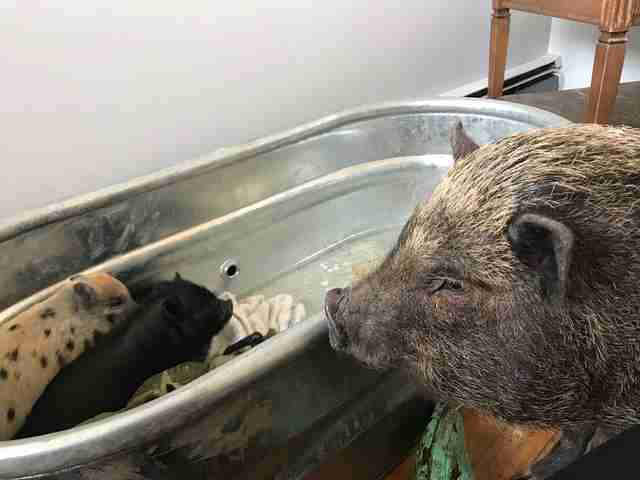 When Pitchford and Davis let the piglets out of their trough, Figs made a beeline for Ruby. “They went snout to snout and kissed each other,” Pitchford said. 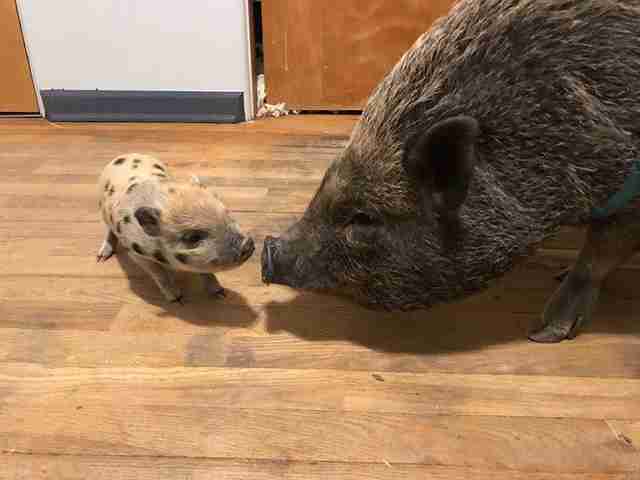 Pitchford and Ruby ended up staying the night, and Ruby would go into the piglets’ room every few minutes to check on them, according to Pitchford. Since Ruby and Figs have such a strong connection, Pitchford plans to adopt Figs once he’s grown up and ready to be rehomed. Until that happens, Pitchford and Ruby will make frequent visits so she can play “mom” to them and give them the comfort their own parent would have. 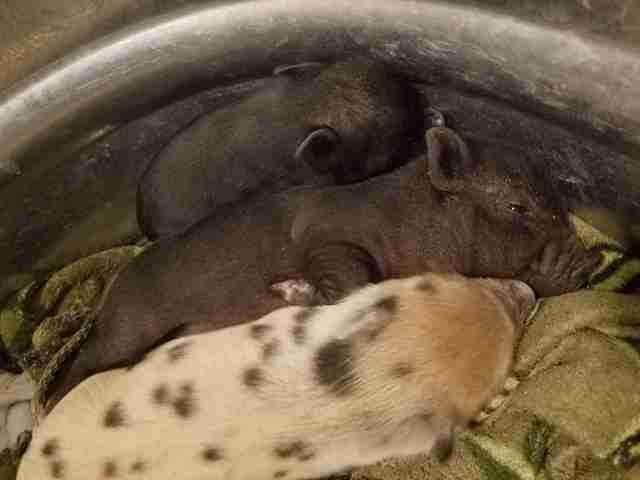 To help the three piglets grow big and strong at the Broken Shovels Farm, you can make a donation to the sanctuary.